If you are looking for a quality product but you want to save money or you are looking for an environmentally-conscious pallet, Reardon Pallet Company, Inc. has you covered. 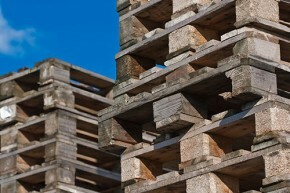 Our customers are able to save as much as 70% by using a recycled pallet! Our recycled pallets vary from rebuilt products from used pallets to fully reusable pallets (sometimes a high quality pallet is only used once and then sold back to us). In the end, you are getting the best of both worlds: a quality product that is easier on your pocket! Give us a call today at (816) 221-3300 to discuss the the sizes and grades of our recycled products that can best benefit your business.